EFA- oxygen-sealed capsules prevent rancidity and give your body the essential fatty acids often missing from the regular diet. A high potent vegetarian (no mercury) form of essential fatty acids. Fresh algae and flax/borage oils are mercury free and provide a balanced level of DHA, EPA and other essential fatty acids. Traditionally DHA oil is an oil obtained from fish. Unfortunately there is no body of water that is free from the ravages of pollution. Fish contain high levels of toxic materials. This DHA oil is derived from micro-algae grown in controlled vats thereby yielding contaminate free DHA, and it's vegan safe. Optimal Health System Essential Fatty Acid formula is the most revolutionary product of its kind on the market today. This new revolutionary stabilized formula provides EFAs from non-animal sources. While most of the other products on the market include only one form of fatty acid, the OHS EFA supplement is a complete formula of all the essential oils that your body needs. The New England Journal of Medicine and The Journal of American Medical Association have proven that essential fatty acids play an important role in the healthy functioning of your heart and cardiovascular system. EFAs have been associated with a decreased risk of high blood pressure, cancer, cardiovascular disease, diabetes, and autoimmune disorders. Good sources of fat contain Unsaturated Fatty Acids (UFAs). The key components of good fats are the essential fatty acids. Omega 3 and Omega 6 Fatty Acids are unsaturated oils that are considered essential because the human body must have them, but cannot make them. Therefore, the body must rely on the foods we eat as its source for good fats. Omega 3 includes Linoleic Acid (LA), and Docosahexaenic Acid (DHA). 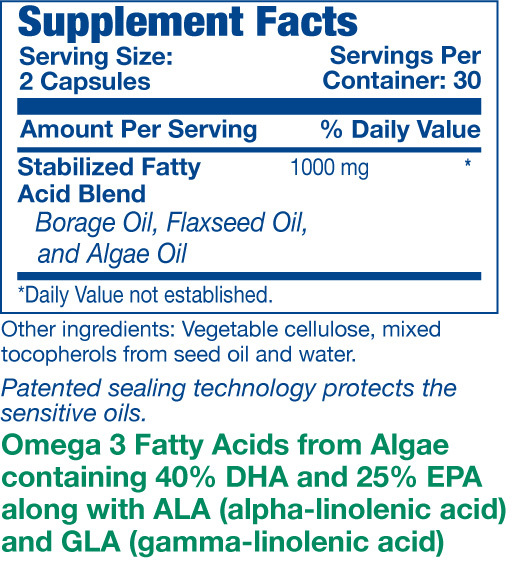 Omega 6 includes Alpha-Linolenic Acid (LNA) and Gamma-Linolenic Acid (GLA). EFAs are involved in energy production, oxygen transfer, hemoglobin production, cell membrane components, recovery from fatigue, prostaglandins, growth cell division and brain development. In addition, LNA produces smooth skin, increases stamina, speeds healing, increases vitality, reduces inflammation, reduces platelet stickiness and blood pressure. WHAT MAKES OPTIMAL EFA DIFFERENT FROM OTHER ESSENTIAL FATTY ACID PRODUCTS ON THE MARKET? Optimal EFA is a unique blend of stabilized oils from plant sources only, making this a choice essential fatty acid source for vegetarians and for those who want to avoid any level of PCBs and other toxins that are found in supplements made from fish oils. PCBs (Polychlorinated biphenyls) are synthetic organic chemicals. Even though PCBs are no longer manufactured in the United States, people are still being exposed to them mostly through the consumption of fish. Recent studies conducted by the Environmental Protection Agency indicate that there are health consequences associated with the exposure such as neurological and developmental deficits in newborns and children, increased cancer risks, effects on the reproductive system, and many more. Most essential fatty acid products on the market contain fish oils. It is important to note that the terms "medical grade" and "pharmaceutical grade" for fish oils do not have a set standard definition. Some products may even state "pharmaceutical grade" if it was manufactured in a FDA certified facility. In general it is used to classify oils that contain less than 10 ppb PCB’s per gram. Using fish oils forces the manufacturer to highly process the oils thus making them more unstable. This can produce an unstable molecule that creates trans-fats that actually cause disease. WHAT ARE THE SOURCES OF OPTIMAL EFA'S FATTY ACIDS? WHY ARE MIXED TOCOPHEROLS ADDED TO OPTIMAL EFA'S FATTY ACID BLEND? Oils are added during the manufacturing process for the consistency of the essential fatty acids to pour into the capsules. Many companies will use synthetic oils. Optimal Health System has chosen NOT to use these synthetics oils and instead uses mixed tocopherols from whole foods. Using this whole food oil also increases the antioxidant capability of the formula. OHS has teamed with one of the leading capsule manufacturers to encapsulate a complete blend of fatty acids in a sealed capsule which will substantially reduce the amount of oxygen exposure. The result is a stabilized EFA product, the first of its kind.